The first release candidate for Rails 3.0 has just been released. This makes it a great time to try out Rails 3, if you haven’t already, and to see what changes will need to be made to your current Rails 2 applications go get them working. In this episode we’ll show you how to upgrade a Rails 2.3 application to Rails 3.0. There are already a number of episodes on Rails 3.0 that you can watch or read and we’ll refer to some relevant episodes as we work through upgrading. The application we’re going to start upgrading is the railscasts.com site, the source code of which is available on Github. Even if you’re not ready to use Rails 3 in production yet it’s still worth trying to upgrade your Rails 2 applications just to see what problems you might run in to. If your applications use Git for source control it’s easy to create a separate branch to experiment on so having downloaded the code we’ll create a new branch called rails3. Before upgrading an application to Rails 3 we should upgrade it to the latest version of Rails 2.3 which at the time of writing is Rails 2.3.8. Likewise, any gems that the application uses should be upgraded to their latest version. This way we’ll ensure that there are no compatibility problems with the latest versions. Once we’ve upgraded Rails and the gems we should run our tests. Having a good automated test suite will help ensure that everything is still working as it should. Everything passes so we’re ready to start the upgrade. For this update we want to use the latest version of Ruby and have a clean slate for our Rails 3 environment and so we’ll use rvm to install the latest version of Ruby 1.9.2 and install Rails 3.0 on top of that. There are frequent updates to rvm so we’ll ensure that we have the latest version by running rvm update before installing Ruby. Now we can use rvm to install Ruby 1.9.2. This command will download, compile and install the latest version of Ruby 1.9.2, currently rc2. When this has completed (it may take a few minutes) we can switch to the new version and check that it works. 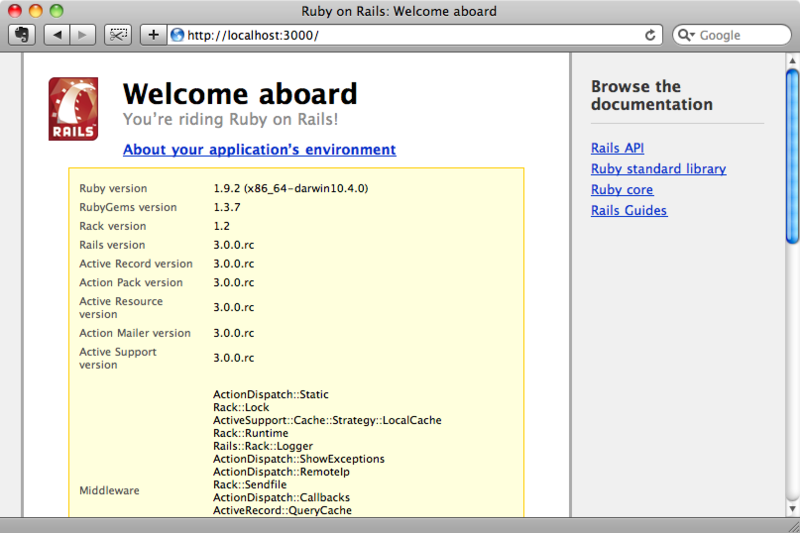 Now that we know that we’re running the correct version of Ruby we can install the Rails 3.0 release candidate gem. Note that as we using an rvm-installed version of Ruby we don’t need to use sudo to install gems. We now have a fresh install of Ruby and Rails 3.0 so we’re ready to begin upgrading our application. To help us there’s an official rails_upgrade plugin that we can use to see what changes we need to make. To install it we’ll first need to swap back to our Rails 2 environment. This is installed on our system version of Ruby so we first need to swap back to it by running. We can now install the plugin. This will show some helpful documentation after it installs. One of the key commands it adds is rake rails:upgrade:check. When we run this command from our application’s directory it will show a list of everything that needs to be updated in our application. The output is too long to show here, but as an example the first part is shown. The router API has totally changed. Before we start the upgrade we’ll run rake rails:upgrade:backup. This will back up some of the key files that are likely to be overwritten during the upgrade. you probably modified them (but now they're safe if you accidentally do!). We start the upgrade by creating a new Rails 3 application in the application’s directory. In order to do that we need to swap back to our Ruby 1.9.2 environment. As we’re creating a new application in the same directory as an existing one we’ll be asked if we want to overwrite some of the existing ones. If we’re not sure if a file should be overwritten we can use the d option to see the differences between the existing file and the one that will be overwritten. The other files will either not have changed from their defaults or will have been backed up, allowing us to move any changes back into the new versions as we go along. Our application has now been upgraded to Rails 3.0 but we still have to go through the files that we backed up and move over any code that is specific to our application. Each backed-up file will be in its original directory with a .rails2 extension so we just need to open up each backup file along with the new version and copy any code we want to keep over. We’ll start with the routes file. The routing syntax has changed but the old syntax still works in Rails 3.0, although it has been deprecated. For now we can just paste in the routes from the backup file into the new routes file and we’ll test it later. Next we’ll take a look at the /config/environment.rb file. Fixing this will involve a little more work as the configuration has changed quite a lot in Rails 3. The default Rails 3 environment file is quite short as the configuration options don’t belong there any more, going instead into the /config/application.rb file. There are three sections of the backed-up environment.rb file that we need to consider. The first is the time zone configuration code. This line can be moved into /config/application.rb. The second part is the session code. In Rails 3 this code belongs in an initializer file and if we look at that file we’ll see the code for configuring the application’s session data. We can leave this code as it is for now. It might need to be changed later on but that won’t be necessary in order to get the site up and running. Finally, at the bottom of the backed-up envronment.rb file is the code that configures the application’s gems. config.gem "RedCloth", :lib => 'redcloth', :version => ">= 4.0"
As well as changing config.gem to gem on each line there are a couple of other changes that we need to make. Version numbers are now just supplied as a second argument and the :lib option is now :require. Once we have done that we need to run bundle install to make sure that all of the required gems are installed. For more information about bundler and installing gems you can watch or read episode 201. We won’t go into moving code from the other backup files but it should be fairly straightforward to transfer the necessary code. With the gems installed we’ll try starting the server to see if the application will start. It won’t and the reason is that there’s an error in the will_paginate gem’s code where we have an undefined returning method. This method was available in Rails 2 but has been removed in Rails 3. In cases like these it’s worth checking the RubyGems website to see if there is a newer prerelease version of the gem available that is compatible with Rails 3.0. In the case of will_paginate there is and we can use it by adding a version number for that gem in our Gemfile. If we run bundle install again the prerelease version of the gem will be installed and we’ll be able to use it in our application. Now that we have that newer version installed we can try running the server again. This error appears to be caused by the Thinking Sphinx gem. Again there is a prerelease version available that we can use instead so we can make another change to the Gemfile and then run bundle install again. Let’s try running the server again. This time we get a little further. The server does try to start but then complains about an undefined variable or method called map in the routes. As we’ve pasted the old routing code over into the new routes file we’re calling a map variable but that variable isn’t passed to the block as it isn’t required in Rails 3. We can still use the old routing syntax though and pass that variable in. When we try to start the server up again it’s fourth-time lucky and it boots up without any errors. If we visit the home page in a browser now we’ll see the default home page as it will have been recreated in the /public directory when we created the Rails 3 application. We can see from this page that the correct environment is being used our app. Even though we have our application booting successfully there’s still a lot we need to fix as we’ll see if we run rails:upgrade:check again. We also need to run our specs again to see if they pass. We’ll cover these in the next episode.